From Concept to Objectivity uncovers the nature and authority of conceptual determination by critically thinking through neglected arguments in Hegel’s Science of Logic pivotal for understanding reason and its role in philosophy. Winfield clarifies the logical problems of presuppositionlessness and determinacy that prepare the way for conceiving the concept, examines how universality, particularity, and individuality are determined, investigates how judgment and syllogism are exhaustively differentiated, and, on that basis, explores how objectivity can be categorized without casting thought in irrevocable opposition to reality. 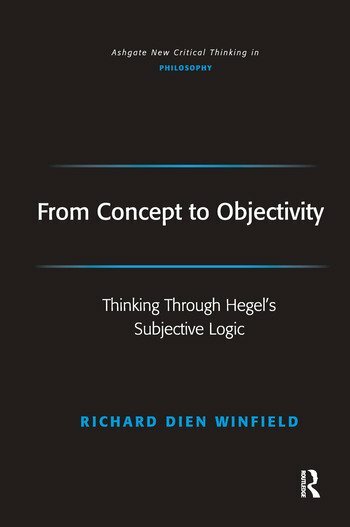 Winfield's book will be of interest to readers of Hegel as well as anyone wondering how thought can be objective. Contents: Introduction; Formal, transcendental, and systematic logic; Method in systematic logic; Determinacy without appeal to the given; Concept, individuality, and self-determination; From concept to judgment; The forms of judgment and the types of universals; The system of syllogism; Objectivity in logic and nature; Works cited; Index. Richard Dien Winfield is Distinguished Research Professor in the Philosophy Department at the University of Georgia, USA.